As I near the 7 week mark of my tenure as a mother of 4, I figure it is time to document what life is like at the moment. This post is timely as I was just recently named recipient of the loathed Mother of the Year Award. In short, I’m drowning. Overwhelmed and drowning, but the kids are all alive and healthy so I figured, technically, I’m hitting the “meets expectations” category on my performance reviews. Then, Friday night happened. We found a new sitter and were finally ready to leave her with the three bigger kids for a date. Then I realized, not only did we have baseball practice at 5:15, we also had the make-up basketball game for the snow day. Plan B: sitter would watch Keaton so that she didn’t lose her planned income due to my baby brain and both the practice and game would be MUCH easier without him. After loading everyone up and making it to practice, all the moms decided that it was ugly out and being Friday, we should just cancel. No problem. Chris had left work early (he worked a mere 9 or 10 hours that day) to meet us so, we decided to grab dinner prior to the game. It was Carter’s last game so, it was a pretty big deal. When we got to the gym, we didn’t see his team warming up. We saw them leaving the gym. Yep. Mom had misread the schedule and we had MISSED HIS LAST GAME. Gut punch. At first he was so thrilled with his trophy and medal that I figured we were okay. Then he realized what had happened and the tears poured. I had to keep mine in. My exhaustion from 6 weeks without a decent night’s sleep and the guilt were overtaking me. Immediately I announced that it was an ice cream night. First clue as to the level of my guilt – I offered sugar to my kids late in the evening. Chris just laughed and allowed me to try to buy my way out of the mess. The tears dried on the way to DQ and we ordered them (Coen as well) an Orange Julius thinking they would love them ’cause who doesn’t love and Orange Julius? No, it’s not ice cream, but a treat is a treat, no? As we waited Carter asked quite seriously from the backseat, “Mom, why did you let me down?” UGH! Seriously Buddy? As painful as that was, Chris and I had to hide our laughter. “let him down?” where did he get that phrase and how did he know how to rub the salt in the wound? Having “let down” one kid already, I turned to the next and heard Coen from the backseat announce, “Mom, you accidentally got me juice” after tasting his Julius. Just for good measure, I went ahead and ran out of diapers for Kacher when we got home. You know, I wanted to really seal the deal on this Mother of the Year thing. I’m exhausted and have never felt so disorganized in my life. Yes, I know, I have four kids now and I need to cut myself some slack . The sad part is that I am, but even with the slack I’m not keeping up. It is terribly fun watching the three have fun together knowing #4 will join soon enough, but darn it! It sure would be nice to have a semi-clean house, some clean laundry and be in a great mood when my awesome husband gets home from his long day of work. Maybe I’ll give myself more slack and just try for the good mood for my husband part. 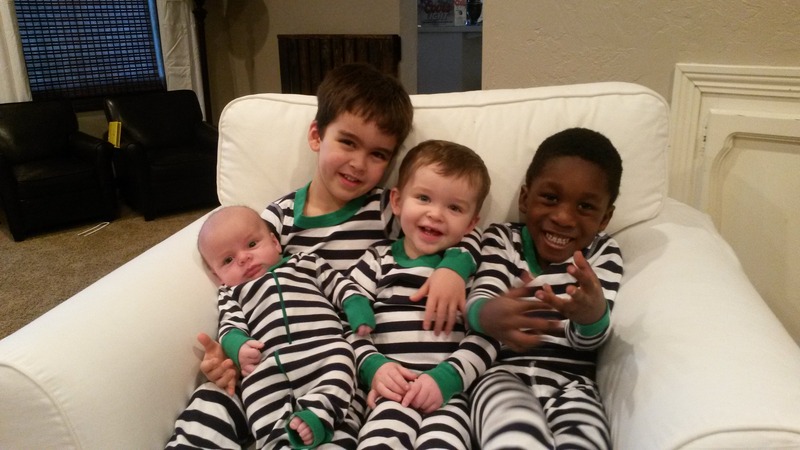 I did win some points back with the boys when I scored a coupon for Hanna Andersson and got them matching PJs. They LOVE to match! Loved the post.LOVED the picture of them in the new PJ’s!!!!!! Don’t be so hard on yourself, you are human, and seems to me like you are doing a wonderful job from the health and happiness I see in those boys faces in the picture. That is the cutest picture! !